On Friday December 5th, 2014, we held our annual Turkey & Gift Draw. The event was well attended with the entire Parish Hall filled to capacity. This was an exciting event that helped raise money to support the various charities that our Council supports. Snacks and refreshments were provided to those attended and there was beautiful musical entertainment provided throughout the entire evening. Draw tickets were $2.50 each or 5 tickets for $10.00. 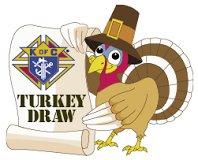 Over 30 turkeys and 200 prizes were handed out. We hope to see you again next year. Mark your calendar for the first Friday in December (December 4, 2015) and check back here in early October 2015 for more information. If you are able to offer assistance by providing a financial or gift donation, please contact us.